Although it’s so tempting to run straight for the water when the surf is pumping, just take a couple of minutes to warm-up your body and loosen off tight muscles and joints before you jump in. Your body will thank you for it in the long term! Yoga and surfing go hand in hand. We have both become much better surfers in the years that we have had solid yoga practices. A regular practice, say an hour twice a week, will make you stronger in the water and also help prevent injury as well as helping you to become more body aware and have better stance and stability on your board. That’s not to say you need to do a full on class before heading out for a surf though! Just a few poses will be enough to get the heart rate up and muscles moving to get you water ready! 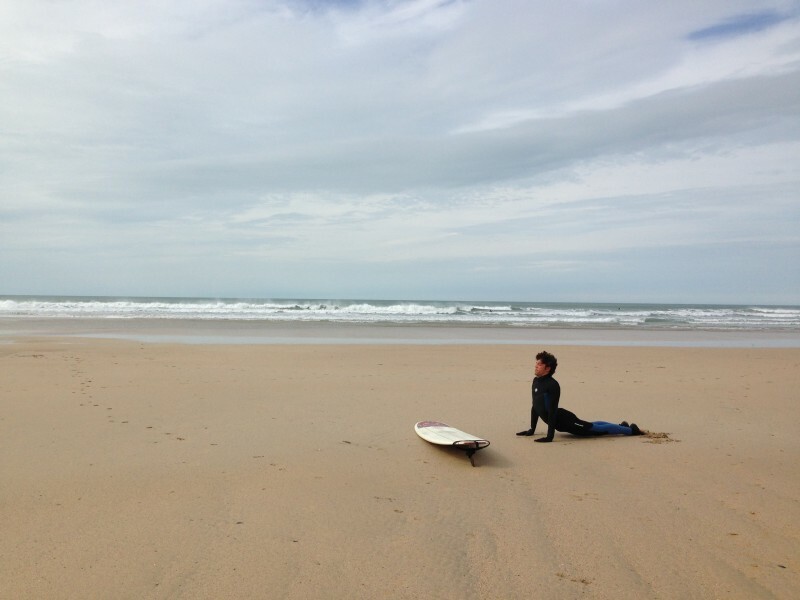 We’ve listed our favourite shapes below that have helped us get warm on a cold Cornish beach! This is a great pose to warm up the lower back and shoulders ready for paddling. Lie flat on the sand with the hands parallel to your chest. Push into the tops of the toes, peel the chest up slowly keeping a soft bend in the elbows and the shoulders down away from the ears. Stay here for a couple of breaths, lower down and repeat two more times. Another great pose for warming up the arms, core and also the back of the legs. 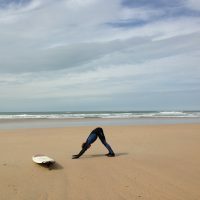 From hands and knees, push the hands into the sand as you lift the knees sending your hips up to the sky. Spend a few breaths bending alternate knees and also moving forward and back to warm the shoulders. Taking a lunge on each leg opens up the hips and inner thighs to get you ready for pop-ups and riding your board. Lifting the arms up and back will get a nice back-bend going on, prepping the back muscles for nose riding! From hands and knees, take one foot forward between your hands, making sure the knee is directly over your ankle. The back leg can come slightly back so you’re on top of the kneecap but ensure both hips are facing forward. Take your arms up, shoulders pull back and down. Take a few breaths here and then repeat on the other leg. Twists warm the muscles, joints and get the body heating up, great if its cold in the water! From lunge, take the hands together at the centre of your chest, lift up nice and tall through the upper body and turn to the same direction as the front leg. Try and hook the opposite elbow on the outside of the thigh and twist round to look behind you. Take a few deep breaths here, every exhale twisting a little deeper and feel the warmth rise in your body! Repeat the other side.